This beautiful contemporary hacienda style rental villa features 8 330 square feet of interior living space, seven bedrooms and seven and a half bathrooms. Overlooking the 18th hole and Cabo del Sol club house, the blue waters of the Sea of Cortez make a stunning backdrop for this vacation villa in Los Cabos. Casa de la Familia has two master bedrooms, three guest bedrooms and kid's room area and a separate casita area. This beautiful vacation rental home also features a gourmet kitchen, two pools with water slide, pool-side entertainment area and palapa with a fire pit area to enjoy the Los Cabos evenings. Gather around the game room with a pool table and media room for a perfect family relaxation experience. Cabo del Sol is only a ten minute drive to downtown Cabo San Lucas. From Casa de la Familia you are within walking distance to the Cabo del Sol beach and Sheraton Hacienda del Mar hotel. 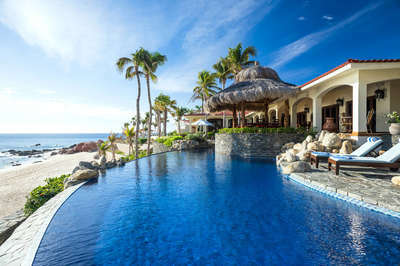 As a guest of Casa de la Familia you will have access to the Sheraton Hacienda del Mar facilities, pool, spa, gym, restaurants (during peak holidays, this may not be possible due to high occupancy) and will receive discounts on green fees at Questro and Palmilla golf courses. Media room with large TV and Xbox console. Two part pool with water slide. One airport to villa transfer in luxury late model Suburban (maximum six guests). Welcome cocktails and light snack (margaritas or lemonade, salsa, chips and guacamole) on arrival. Daily housekeeping service (except Sunday and holidays, available at extra cost). Cabo del Sol offers a myriad of opportunities to relax in the finest accommodations, offering unmatched comfort in a truly spectacular setting. Cabo del Sol is development is nestled in Mexico's premier golf resort community with over 1 800 master planned acres. Bringing together the world’s most notable golf course designers, architects and golf course management experts to Cabo del Sol.